Powers/Abilities: The Black Moray armor contained many deadly devices that could be deployed underwater, including powerful electrode-clamps, twin helmet-lasers capable of cutting through titanium, black ink clouds, depth charges, telepathic blockers, and recoil dampeners. History: (Namor I#57 (fb) - BTS) - When Namor's father, Leonard McKenzie, believed his wife, Fen, would never return, he remarried and had a son, Lawrence McKenzie. Lawrence also had a son named Leon. (Namor I#29 (fb)) - Leon was an employee for the Rand-Meachum Corporation before the company was bought out by Namor's company, Oracle, Incorporated. (Namor I#57 (fb) - BTS) - Leon in time became the director of operations for the west coast branch of Oracle, Incorporated. 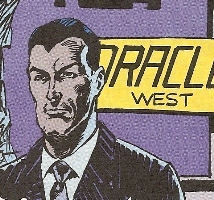 (Namor I#29 (fb)) - Leon, as the head of the company on the west coast, saw a money-making opportunity by creating terrorists to fight against Oracle's projects in the area. He contacted Tess Walker, a local sheriff's daughter, and the two began organizing the local community to make 'eco-terrorist' attacks on Oracle's company. Leon and Tess would then split the money gathered by the insurance from these attacks. (Namor I#26 - BTS) - Leon called Tess, but she had to go quickly as the amnesiac Namor (though she didn't know it was Namor) was right by her. (Namor I#27) - Leon called Tess again, to confirm their appointment. Leon met Tess that night, and gave her a bank account number with her eleven million dollars in it. He tried to come on to her, but she resisted. Tess let him know that "Rex" was almost on her side. (Namor I#28) - Back at Oracle, Leon received a call from Tess to let him know that she'd convinced their allies that Rex was on their side, and that they now had a super-strong "eco-terrorist" who could wield even more destruction. Leon had to quickly hang up when Namorita Prentiss, acting CEO of Oracle, surprised him with a visit. When Namorita said she was looking for Namor in the area, Leon realized that Rex was Namor himself. Leon promised Namorita that he would marshal Oracle's forces to aid her in her search for Namor. (Namor I#29 (fb)) - Namorita returned to Oracle to make a phone call. With a passing word about Namor, Leon accidentally revealed his involvement in the terrorism. Namorita violently interrogated him until he'd revealed everything. (Namor I#48 (fb) - BTS)- The police didn't try Leon in the eco-terrorism affair. (Namor I#52 (fb)) - At some point, Leon got his hands on his father's journal and learned of the ship, Endurance, being sent to the Antarctic to mine Antarctic Vibranium in 1915. The ship was lost, so Leon's grandfather took another ship in 1920 to find the Endurance. The mission was unsuccessful, though that mission did lead to Namor's conception. (Namor I#48) - At his Oracle headquarters, Leon planned a mission to use Oracle's funds to salvage his father's ship. While planning, he was shocked by Phoebe Marrs (acting head of Oracle, but who, in this case, was actually Llyra in disguise) storm in, and he quickly hung up the phone. He grew defensive about the eco-terrorism affair, and was shocked when Phoebe threw him on the desk, seducing him. (Namor I#53 (fb) - BTS) - "Phoebe" put Leon in contact with the undersea Ancient, Sea Leopard, who was guardian of the Endurance. Leon made a pact with Sea Leopard that he would find one follower to worship Sea Leopard in exchange for one ounce of Antarctic Vibranium, which Leon planned to use to garner a fortune. (Namor I#52) - Leon shared the contents of the journal with his aide, Philip, as they took a ship bound to find the Endurance. Leon cut out the electrical systems of the Free Divers, who had been sent down by Oracle to salvage the Endurance before Leon could claim it. 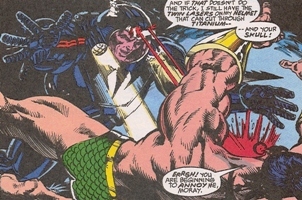 When Namor freed the divers, Leon attacked in his Black Moray armor. He surprised Namor with a series of surprise attacks with offensive weaponry, and sent Namor plunging into Sea Leopard's vicinity. (Namor I#53) - Having gotten Namor to distract Sea Leopard, Black Moray moved to the Endurance and searched for the Vibranium. Sea Leopard launched a whalebone at Black Moray, who defensively stated that Sea Leopard could have Leon's entire crew, the Free Divers, and the population of Old Atlantis as worshippers. Sea Leopard changed the arrangement, however, and now demanded Namor be his subject. When Andromeda and Attuma renewed their attack on Sea Leopard, Black Moray entered the Endurance and found the hold that was supposed to contain the Vibranium, but found Namor there instead. When Namor attacked, Black Moray admitted that "Phoebe" had set up his contact with Sea Leopard, then blew up the entire ship with a depth charge. The suit's recoil dampeners protected him. (Namor I#53 - BTS) - Namor caught Black Moray shortly after and defeated him. He returned Leon to his ship, where he revealed to Leon's shipmates what Leon had planned for them. Namor then donned the Black Moray armor and finished his battle with Sea Leopard. (Namor I#56) - Phoebe Marrs came to visit Leon in prison, demanding to know why he was implicating her in his plots. When Phoebe got riled up, Leon was returned to his cell. Comments: Created by John Byrne, Jae Lee, and Bob Wiacek (unidentifed), expounded upon by Glenn Herdling and Geof Isherwood. any other "Black-" or Moray characters, or to any characters not mentioned in this profile. Seriously, I'm not listing them all. Black Manta, DC character and Aquaman foe. (Namor I#52) - Philip accompanied Leon McKenzie on his quest to the Antarctic to retrieve the Antarctic vibranium stash from the sunken ship, Endurance. Leon shared the journals of Leon's father, Leonard McKenzie, that led him to the treasure. Leon went below the waters in his Black Moray armor to get the treasure. (Namor I#53 - BTS) - Namor returned Leon to his ship, letting Philip and the crew know that Leon had planned to betray them to the Sea Leopard. (Namor I#57 (fb) - BTS) - The son of Leonard McKenzie, Lawrence McKenzie was the father of Leon McKenzie. Nothing else is known about his life or current status.